My gold 1.6 passed its Mot this week and so is back on the road for the first time since 1992! Despite owning one for 8 months I have never driven a Murena or even been in one that is moving before this weekend. It really is rather good - it sort of flows down the road and makes my daily driver Smart Roadster seem unnecessarily darty and stiff legged. 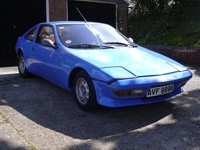 The only issues it has (apart from being the scruffiest Matra on the road) is a banging roof which I see from other posts is not uncommon, the engagement of 4th gear is a bit noisy and a misfire at high revs (6000rpm + I think - so it isn't much of a problem). I would like to benchmark its performance but I can't find a 'full' roadtest of a 1.6 (the Brooklands Book only has full tests on 2.2s). Does anyone have full acceleration figures for a 1.6? Interesting comparison. My other car is a Smart Roadster which I love. My 1.6 has been off the road since 1994 and I have never driven it. I have been making good progress with a total restoration and my intention was to have it ready for the Sydney French car day which is held around 14 July each year. Unfortunately, I have been called to South Africa for a family crisis and I may have to be there for a couple of months so there is no way I will make it this year. Thanks for the replies and the data. I think that my car is pretty much performing as it should do. I love my Smart Roadster too! Between gear changes it feels much faster than the Murena and has huge grip so it is great fun. I am surprised how smooth the Murena engine is - much better than the A and B series BL push rod engines I am used to. Do I need to worry about the slight balking when I engage 4th gear? Regards your 4th. gear balking. Are all the joints and pivots in the gear change linkage all moving freely and not worn out? Best to check everything and make adjustments to the ball joints if required. Have a buddy change gear for you whilst you check out 4th. gear selection on the gearbox and this may help clarify the problem. I have checked all the gearbox links and they seem ok. It is possible to get a smooth change by double de-clutching so I guess it might be a worn synchro - is that likely?. If the synchro has started to wear should I expect rapid deterioration? Does the gearbox have synchromesh on 1st gear? - I can only engage it without balking when stationary. Is there a way to fill the tank that doesn't involve a rush of petrol over your feet at the end? It does seem to lock its front wheels more readily than other non abs cars I have had - hopefully this will improve as I put some miles into the (brand new) tyres. Does the gearbox have synchromesh on 1st gear? - I can only engage it without balking when stationary. Yes, I wonder if, given your other troubles if you don't have a clutch problem. Does reverse engage without crunching? All the gears have synchros. I tend to think you have a clutch that does not release fully, as suggested. And if you put the gas nozzle in as far as it will go and angle it towards the tank, there is less chance of gas spilling out. But never have the flow full on. American gas stations have a rubber tube around the nozzle that seals around the filler hole. It prevents the gas from splashing all over you, but not overflowing. Never seen that in EU. Thanks for the replies and the suggestions. I have bleed the clutch and replaced the ball joint at the end of the gear selector rod. The gear change now feels more positive. The clutch hasn't changed - but it shows no sign of drag - the car will roll backwards on a slight incline if it is in 1st gear with the clutch pedal depressed. However the noise on selection of 4th gear and 1st (if the car is moving) is unchanged. Reverse is easy to engage and 5th to 4th changes are noiseless if I rev match and 3rd to 4th is noiseless if I double de-clutch, is there anything else I can check? The only part of the linkage I am unsure of is the bracket that is bolted to the chassis in front of the engine and locates the selector rod. I have tightened the single nut that secures it so the bracket can't move but I wonder whether it should somehow allow some lateral movement of the rod? Otherwise the car continues to go well. The first brim to brim fuel consumption was 26.5mpg which I think is ok for a series of short 'test drives' down country lanes. If the change is better with double de-clutching then it does suggest the problem is synchros. But it may not be that they are worn, unless the car really had done lots of mileage (or been run with low oil). A modern gearbox with modern oil should be able to do something like 250,000 kms with no real problems, possibly more. This, combined with the above problem with fourth synchro, suggests one of the faulty boxes I'm afraid. The early 80/81 boxes had incorrect mismatched parts on assembly. Often it is no use just replacing the syncho rings which won't be worn out anyway, as new ones will only stop the problem for a short time until the top edges of the teeth are worn during bedding in. The gears need to be changed so the angles and clearances are correct. I am due to swap another box for this reason on another Murena 1.6 with very little mileage. Yes. The problem is that the filling pipe from cap to the tank is almost horizontal, so if you use the full trigger on the fuel pumps the delivery is far too fast. You have to limit the delivery speed by using say half the trigger movement. New tyres need bedding in (for about 200 miles at lowish speeds) to get rid of the mould releasing compound that is on all tyres. This releasing agent tends to make new tyres slippery until worn off. If they are still slippery or locking easily after the releasing agent has gone, then I suggest there is something wrong. A Murena should not lock the front wheels easily and should grip well. It can depend on the particular tyres of course. What tyres have you fitted? (full spec. please brand, size and rating etc. - you can email me if you prefer not to detail it here.) Have you read the FAQ section on my website, particularly on tyres? Also one further thing - you suggest you got 26.5 mpg recently. 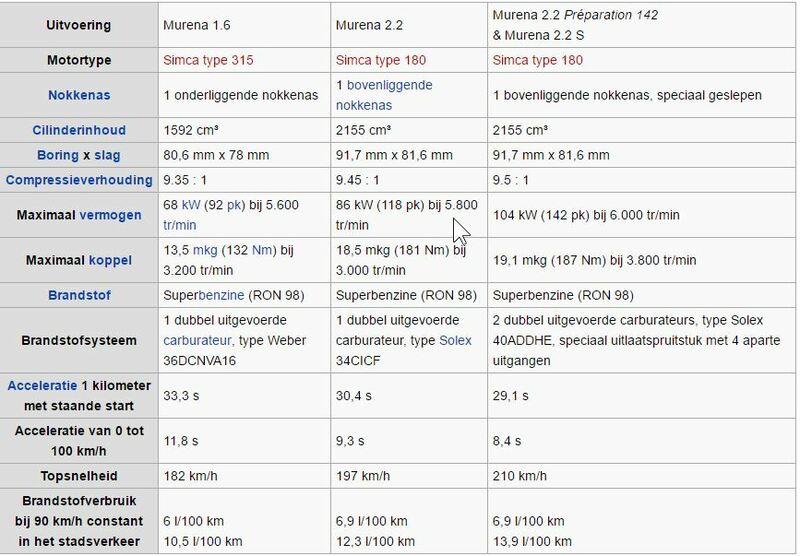 That is much too thirsty for a 1.6 Murena if everything is correct unless you are using lots of high revs on those very short journeys. I get 31 mpg from my 2.2 and the 1.6 should be the same or better. Thanks for the advice Roy. My car has only done 107,000km, but it is a 1981 and I think from the first half of the cars made that year (chassis number BX-6115**). If I have got one of the bad gearboxes what are my options to sort it out - are the gearsets available? - or do I need to hunt for a later second hand one? Or I suppose I could hone my double declutching skills and continue to work round the problem - it sounds like the existing box has little value so any damage I cause to it if I miss time my changes will not be much of a loss? The tyres have now done 800km and the wheel locking problem has gone away. I think I followed the advice on your website - 195/60R14-86H on the back and 175/55R14-80H on the front - all Toyo Proxes CF2, which was the only type I could easily get both sizes in. I have mastered the art of filling it without covering my shoes and the mpg is improving - 26.5mpg I think was the result of short fast-ish runs and a fair bit of ticking over on the drive while I tried to get to the bottom of why it kept stalling (it was a blocked idle jet). It is now around 30mpg - still on short runs. About filling tank, don't fill with a hot engine to the max. Because there is a plastic tank it will shrink during cooldown and fuel will be spilled making the floor wet. There was a modification kit for the filling problem making your shoes wet. During fill up a airbubble get in the top of the tank. To prevent that a extra connection/ventil was made from the top to the fillerneck. Remember to not put any cap on the filler neck. The cap needs to be not vented. It is not the tank that changes shape (well very little anyway) it is the fuel itself that takes up less volume when cold compared to when hot. As you fill the fuel tank, the fuel coming from the underground storage tank is cold. Once in the Murena it will not only warm to ambient temperature, but actually get heated further because of the tanks location in the engine compartment. That expands the fuel and since the breather valve is quite low in the filler pipe neck, the increased volume means that the fuel floods the valve. From there it leaks out through the overflow/vent hose, onto the floor. The result is the same as Herman states, that you MUST not fill the tank and then park it up straight away otherwise you will end up with a pool of fuel under the car, and the fumes from this are highly combustible. There was another modification that moved the ventilation valve to the top of the fuel tank, with the original hole blanked off. 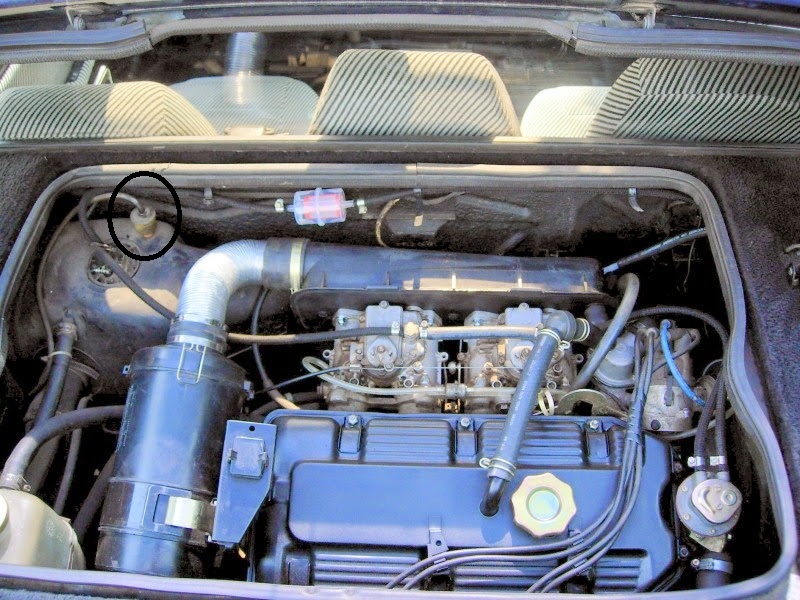 (as with the 'S' models) It did not matter then if the fuel reached the height of the original valve position, as it warmed up, since it would still be contained. The valve in the top of the tank is much too far above the surface to ever be reached and can therefore do its job correctly. I have now produced a technical article covering various aspects of the fuel tank and breather system, and this is available for download from my website, and the new technical section. P.S. If you downloaded that fuel article before today (6th September) please delete it, and download the new * updated * one. I had to amend it with regard to the CBS ventilation valve as it does not have the thread right up to the collar. Please note my important update to the last posting, thanks.